Place half of the potatoes and 1/4 cup of the water in 2-quart microwavable casserole. Cover and microwave on High 10 to 12 minutes or until potatoes are tender; drain. Repeat with remaining potatoes and water. Mix mayonnaise, sour cream and salsa in large bowl. Gently stir in potatoes and remaining ingredients. To spice up this south-of-the-border salad, seed and finely chop a jalapeño chili to use instead of the canned green chilies. 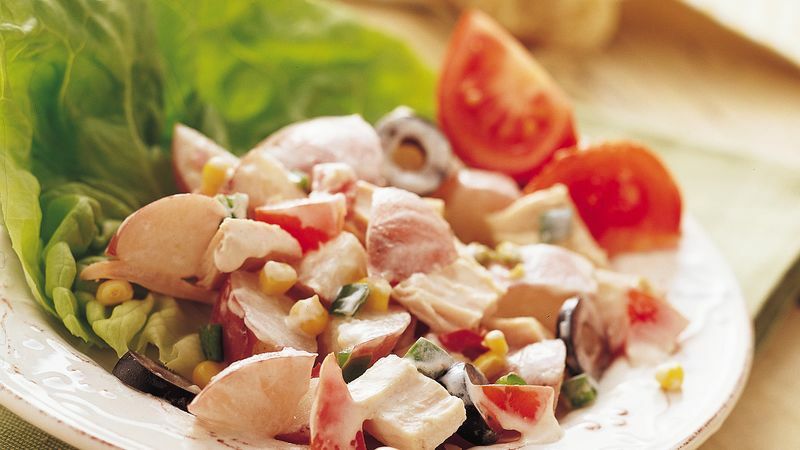 You can trim the fat to 4 grams per serving by using low-fat or fat-free mayonnaise and sour cream. Dressing up this flavorful potato salad is easy. Serve in a lettuce-lined bowl, and garnish with additional sliced ripe olives and shredded Cheddar cheese.